With thanks to the hundred or so people who contributed examples in two dozen programming languages, who helped with suggestions and fixes, and who kept pushing for more examples of how to connect your code. Thanks to Bill Desmarais, Brian Dorsey, Daniel Lin, Eric Desgranges, Gonzalo Diethelm, Guido Goldstein, Hunter Ford, Kamil Shakirov, Martin Sustrik, Mike Castleman, Naveen Chawla, Nicola Peduzzi, Oliver Smith, Olivier Chamoux, Peter Alexander, Pierre Rouleau, Randy Dryburgh, John Unwin, Alex Thomas, Mihail Minkov, Jeremy Avnet, Michael Compton, Kamil Kisiel, Mark Kharitonov, Guillaume Aubert, Ian Barber, Mike Sheridan, Faruk Akgul, Oleg Sidorov, Lev Givon, Allister MacLeod, Alexander D'Archangel, Andreas Hoelzlwimmer, Han Holl, Robert G. Jakabosky, Felipe Cruz, Marcus McCurdy, Mikhail Kulemin, Dr. Gergő Érdi, Pavel Zhukov, Alexander Else, Giovanni Ruggiero, Rick "Technoweenie", Daniel Lundin, Dave Hoover, Simon Jefford, Benjamin Peterson, Justin Case, Devon Weller, Richard Smith, Alexander Morland, Wadim Grasza, Michael Jakl, Uwe Dauernheim, Sebastian Nowicki, Simone Deponti, Aaron Raddon, Dan Colish, Markus Schirp, Benoit Larroque, Jonathan Palardy, Isaiah Peng, Arkadiusz Orzechowski, Umut Aydin, Matthew Horsfall, Jeremy W. Sherman, Eric Pugh, Tyler Sellon, John E. Vincent, Pavel Mitin, Min RK, Igor Wiedler, Olof Åkesson, Patrick Lucas, Heow Goodman, Senthil Palanisami, John Gallagher, Tomas Roos, Stephen McQuay, Erik Allik, Arnaud Cogoluègnes, Rob Gagnon, Dan Williams, Edward Smith, James Tucker, Kristian Kristensen, Vadim Shalts, Martin Trojer, Tom van Leeuwen, Pandya Hiten, Harm Aarts, Marc Harter, Iskren Ivov Chernev, Jay Han, Sonia Hamilton, and Zed Shaw. Thanks to Stathis Sideris for Ditaa, which I used for the diagrams. Please use the issue tracker for all comments and errata. This version covers the latest stable release of ØMQ (3.2) and was published on Tue 23 October, 2012. If you are using older versions of ØMQ then some of the examples and explanations won't be accurate. The Guide is originally in C, but also in PHP, Python, Lua, and Haxe. We've also translated most of the examples into C++, C#, CL, Erlang, F#, Felix, Haskell, Java, Objective-C, Ruby, Ada, Basic, Clojure, Go, Haxe, Node.js, ooc, Perl, and Scala. How to explain ØMQ? Some of us start by saying all the wonderful things it does. It's sockets on steroids. It's like mailboxes with routing. It's fast! Others try to share their moment of enlightenment, that zap-pow-kaboom satori paradigm-shift moment when it all became obvious. Things just become simpler. Complexity goes away. It opens the mind. Others try to explain by comparison. It's smaller, simpler, but still looks familiar. Personally, I like to remember why we made ØMQ at all, because that's most likely where you, the reader, still are today. Programming is a science dressed up as art, because most of us don't understand the physics of software, and it's rarely if ever taught. The physics of software is not algorithms, data structures, languages and abstractions. These are just tools we make, use, throw away. The real physics of software is the physics of people. Specifically, our limitations when it comes to complexity, and our desire to work together to solve large problems in pieces. This is the science of programming: make building blocks that people can understand and use easily, and people will work together to solve the very largest problems. If you've done any work with threads, protocols, or networks, you'll realize this is pretty much impossible. It's a dream. Even connecting a few programs across a few sockets is plain nasty, when you start to handle real life situations. Trillions? The cost would be unimaginable. Connecting computers is so difficult that software and services to do this is a multi-billion dollar business. Brooks missed free and open source software, which solved that crisis, enabling us to share knowledge efficiently. Today we face another software crisis, but it's one we don't talk about much. Only the largest, richest firms can afford to create connected applications. There is a cloud, but it's proprietary. Our data, our knowledge is disappearing from our personal computers into clouds that we cannot access, cannot compete with. Who owns our social networks? It is like the mainframe-PC revolution in reverse. We can leave the political philosophy for another book. The point is that while the Internet offers the potential of massively connected code, the reality is that this is out of reach for most of us, and so, large interesting problems (in health, education, economics, transport, and so on) remain unsolved because there is no way to connect the code, and thus no way to connect the brains that could work together to solve these problems. 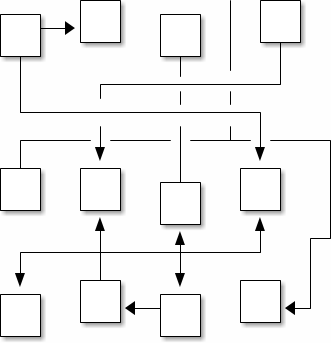 There have been many attempts to solve the challenge of connected software. There are thousands of IETF specifications, each solving part of the puzzle. For application developers, HTTP is perhaps the one solution to have been simple enough to work, but it arguably makes the problem worse, by encouraging developers and architects to think in terms of big servers and thin, stupid clients. So today people are still connecting applications using raw UDP and TCP, proprietary protocols, HTTP, Websockets. It remains painful, slow, hard to scale, and essentially centralized. Distributed P2P architectures are mostly for play, not work. How many applications use Skype or Bittorrent to exchange data? ØMQ (ZeroMQ, 0MQ, zmq) looks like an embeddable networking library but acts like a concurrency framework. It gives you sockets that carry atomic messages across various transports like in-process, inter-process, TCP, and multicast. You can connect sockets N-to-N with patterns like fanout, pub-sub, task distribution, and request-reply. It's fast enough to be the fabric for clustered products. Its asynchronous I/O model gives you scalable multicore applications, built as asynchronous message-processing tasks. It has a score of language APIs and runs on most operating systems. ØMQ is from iMatix and is LGPLv3 open source. We assume you are using the latest 3.2 release of ØMQ. We assume you are using a Linux box or something similar. We assume you can read C code, more or less, that's the default language for the examples. We assume that when we write constants like PUSH or SUBSCRIBE you can imagine they are really called ZMQ_PUSH or ZMQ_SUBSCRIBE if the programming language needs it. And then browse the examples subdirectory. You'll find examples by language. If there are examples missing in a language you use, you're encouraged to submit a translation. This is how the Guide became so useful, thanks to the work of many people. All examples are licensed under MIT/X11. The REQ-REP socket pair is lockstep. The client does zmq_msg_send(3) and then zmq_msg_recv(3), in a loop (or once if that's all it needs). Doing any other sequence (e.g. sending two messages in a row) will result in a return code of -1 from the send or recv call. Similarly the service does zmq_msg_recv(3) and then zmq_msg_send(3) in that order, and as often as it needs to. Now this looks too simple to be realistic, but a ØMQ socket is what you get when you take a normal TCP socket, inject it with a mix of radioactive isotopes stolen from a secret Soviet atomic research project, bombard it with 1950-era cosmic rays, and put it into the hands of a drug-addled comic book author with a badly-disguised fetish for bulging muscles clad in spandex. Yes, ØMQ sockets are the world-saving superheroes of the networking world. You could literally throw thousands of clients at this server, all at once, and it would continue to work happily and quickly. For fun, try starting the client and then starting the server, see how it all still works, then think for a second what this means. Let me explain briefly what these two programs are actually doing. They create a ØMQ context to work with, and a socket. Don't worry what the words mean. You'll pick it up. The server binds its REP (reply) socket to port 5555. The server waits for a request, in a loop, and responds each time with a reply. The client sends a request and reads the reply back from the server. If you kill the server (Ctrl-C) and restart it, the client won't recover properly. Recovering from crashing processes isn't quite that easy. Making a reliable request-reply flow is complex enough that I won't cover it until Chapter Four. There is a lot happening behind the scenes but what matters to us programmers is how short and sweet the code is, and how often it doesn't crash, even under heavy load. This is the request-reply pattern, probably the simplest way to use ØMQ. It maps to RPC and the classic client-server model. ØMQ doesn't know anything about the data you send except its size in bytes. That means you are responsible for formatting it safely so that applications can read it back. Doing this for objects and complex data types is a job for specialized libraries like Protocol Buffers. But even for strings you need to take care. Then what goes onto the wire is a length (one byte for shorter strings) and the string contents, as individual characters. And if you read this from a C program, you will get something that looks like a string, and might by accident act like a string (if by luck the five bytes find themselves followed by an innocently lurking null), but isn't a proper string. Which means that your client and server don't agree on the string format, you will get weird results. When you receive string data from ØMQ, in C, you simply cannot trust that it's safely terminated. Every single time you read a string you should allocate a new buffer with space for an extra byte, copy the string, and terminate it properly with a null. So let's establish the rule that ØMQ strings are length-specified, and are sent on the wire without a trailing null. In the simplest case (and we'll do this in our examples) a ØMQ string maps neatly to a ØMQ message frame, which looks like the above figure, a length and some bytes. This makes a very handy helper function and in the spirit of making things we can reuse profitably, let's write a similar 's_send' function that sends strings in the correct ØMQ format, and package this into a header file we can reuse. The result is zhelpers.h, which lets us write sweeter and shorter ØMQ applications in C. It is a fairly long source, and only fun for C developers, so read it at leisure. There's no start, and no end to this stream of updates, it's like a never ending broadcast. Note that when you use a SUB socket you must set a subscription using zmq_setsockopt(3) and SUBSCRIBE, as in this code. If you don't set any subscription, you won't get any messages. It's a common mistake for beginners. 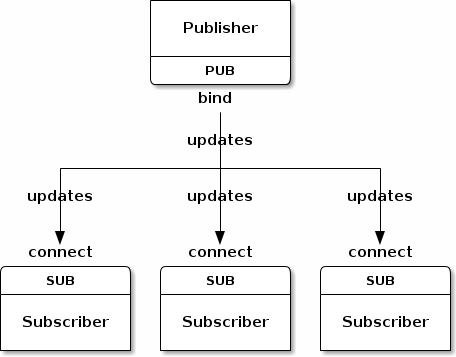 The subscriber can set many subscriptions, which are added together. That is, if a update matches ANY subscription, the subscriber receives it. The subscriber can also unsubscribe specific subscriptions. Subscriptions are length-specified blobs. See zmq_setsockopt(3) for how this works. The PUB-SUB socket pair is asynchronous. The client does zmq_msg_recv(3), in a loop (or once if that's all it needs). Trying to send a message to a SUB socket will cause an error. Similarly the service does zmq_msg_send(3) as often as it needs to, but must not do zmq_msg_recv(3) on a PUB socket. In theory with ØMQ sockets, it does not matter which end connects, and which end binds. However in practice there are undocumented differences that I'll come to later. For now, bind the PUB and connect the SUB, unless your network design makes that impossible. Then the subscriber will most likely not receive anything. You'll blink, check that you set a correct filter, and try again, and the subscriber will still not receive anything. Making a TCP connection involves to and fro handshaking that takes several milliseconds depending on your network and the number of hops between peers. In that time, ØMQ can send very many messages. For sake of argument assume it takes 5 msecs to establish a connection, and that same link can handle 1M messages per second. During the 5 msecs that the subscriber is connecting to the publisher, it takes the publisher only 1 msec to send out those 1K messages. In Chapter Two I'll explain how to synchronize a publisher and subscribers so that you don't start to publish data until the subscriber(s) really are connected and ready. There is a simple and stupid way to delay the publisher, which is to sleep. I'd never do this in a real application though, it is extremely fragile as well as inelegant and slow. Use sleeps to prove to yourself what's happening, and then wait for Chapter 2 to see how to do this right. The alternative to synchronization is to simply assume that the published data stream is infinite and has no start, and no end. This is how we built our weather client example. So the client subscribes to its chosen zip code and collects a thousand updates for that zip code. That means about ten million updates from the server, if zip codes are randomly distributed. You can start the client, and then the server, and the client will keep working. You can stop and restart the server as often as you like, and the client will keep working. When the client has collected its thousand updates, it calculates the average, prints it, and exits. A subscriber can connect to more than one publisher, using one 'connect' call each time. Data will then arrive and be interleaved ("fair-queued") so that no single publisher drowns out the others. If you're using TCP, and a subscriber is slow, messages will queue up on the publisher. We'll look at how to protect publishers against this, using the "high-water mark" later. In the current versions of ØMQ, filtering happens at the subscriber side, not the publisher side. This means, over TCP, that a publisher will send all messages to all subscribers, which will then drop messages they don't want. We have a ventilator that produces tasks that can be done in parallel. We have a set of workers that process tasks. We have a sink that collects results back from the worker processes. The workers connect upstream to the ventilator, and downstream to the sink. This means you can add workers arbitrarily. If the workers bound to their endpoints, you would need (a) more endpoints and (b) to modify the ventilator and/or the sink each time you added a worker. We say that the ventilator and sink are 'stable' parts of our architecture and the workers are 'dynamic' parts of it. We have to synchronize the start of the batch with all workers being up and running. This is a fairly common gotcha in ØMQ and there is no easy solution. The 'connect' method takes a certain time. So when a set of workers connect to the ventilator, the first one to successfully connect will get a whole load of messages in that short time while the others are also connecting. If you don't synchronize the start of the batch somehow, the system won't run in parallel at all. Try removing the wait, and see. The ventilator's PUSH socket distributes tasks to workers (assuming they are all connected before the batch starts going out) evenly. This is called load-balancing and it's something we'll look at again in more detail. The pipeline pattern also exhibits the "slow joiner" syndrome, leading to accusations that PUSH sockets don't load balance properly. 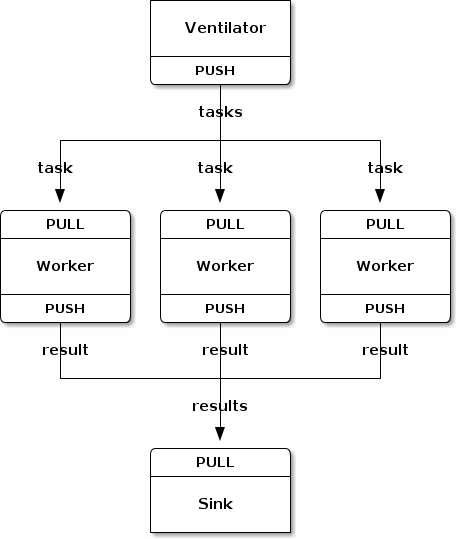 If you are using PUSH and PULL, and one of your workers gets way more messages than the others, it's because that PULL socket has joined faster than the others, and grabs a lot of messages before the others manage to connect. Having seen some examples, you're eager to start using ØMQ in some apps. Before you start that, take a deep breath, chillax, and reflect on some basic advice that will save you stress and confusion. Learn ØMQ step by step. It's just one simple API but it hides a world of possibilities. Take the possibilities slowly, master each one. Write nice code. Ugly code hides problems and makes it hard for others to help you. You might get used to meaningless variable names, but people reading your code won't. Use names that are real words, that say something other than "I'm too careless to tell you what this variable is really for". Use consistent indentation, clean layout. Write nice code and your world will be more comfortable. Test what you make as you make it. When your program doesn't work, you should know what five lines are to blame. This is especially true when you do ØMQ magic, which just won't work the first few times you try it. When you find that things don't work as expected, break your code into pieces, test each one, see which one is not working. ØMQ lets you make essentially modular code, use that to your advantage. Make abstractions (classes, methods, whatever) as you need them. If you copy/paste a lot of code you're going to copy/paste errors too. //  NOTE: do NOT reuse this example code! //  NOTE: do NOT reuse this example code, It's broken. In the end, the problem was that the application was passing sockets between threads, which crashes weirdly. Sockets are not threadsafe. It became legal behavior to migrate sockets from one thread to another in ØMQ/2.1, but this remains dangerous unless you use a "full memory barrier". If you don't know what that means, don't attempt socket migration. Do one zmq_ctx_new(3) at the start of your main line code, and one zmq_ctx_destroy(3) at the end. If you're using the fork() system call, each process needs its own context. If you do zmq_ctx_new(3) in the main process before calling fork(), the child processes get their own contexts. In general you want to do the interesting stuff in the child processes, and just manage these from the parent process. Classy programmers share the same motto as classy hit men: always clean-up when you finish the job. When you use ØMQ in a language like Python, stuff gets automatically freed for you. But when using C you have to carefully free objects when you're finished with them, or you get memory leaks, unstable applications, and generally bad karma. Memory leaks are one thing, but ØMQ is quite finicky about how you exit an application. The reasons are technical and painful but the upshot is that if you leave any sockets open, the zmq_ctx_destroy(3) function will hang forever. And even if you close all sockets, zmq_ctx_destroy(3) will by default wait forever if there are pending connects or sends. Unless you set the LINGER to zero on those sockets before closing them. Always close a message the moment you are done with it, using zmq_msg_close(3). If you are opening and closing a lot of sockets, that's probably a sign you need to redesign your application. When you exit the program, close your sockets and then call zmq_ctx_destroy(3). This destroys the context. If you're doing multithreaded work, it gets rather more complex than this. We'll get to multithreading in the next chapter, but because some of you will, despite warnings, will try to run before you can safely walk, below is the quick and dirty guide to making a clean exit in a multithreaded ØMQ application. First, do not try to use the same socket from multiple threads. No, don't explain why you think this would be excellent fun, just please don't do it. Next, you need to shut down each socket that has ongoing requests. The proper way is to set a low LINGER value (1 second), then close the socket. If your language binding doesn't do this for you automatically when you destroy a context, I'd suggest sending a patch. Finally, destroy the context. This will cause any blocking receives or polls or sends in attached threads (i.e. which share the same context) to return with an error. Catch that error, and then set linger on, and close sockets in that thread, and exit. Do not destroy the same context twice. The zmq_ctx_destroy in the main thread will block until all sockets it knows about are safely closed. Now that you've seen ØMQ in action, let's go back to the "why". How do we handle dynamic components, i.e. pieces that go away temporarily? Do we formally split components into "clients" and "servers" and mandate that servers cannot disappear? What then if we want to connect servers to servers? Do we try to reconnect every few seconds? How do we handle messages that we can't deliver immediately? Particularly, if we're waiting for a component to come back on-line? Do we discard messages, put them into a database, or into a memory queue? Where do we store message queues? 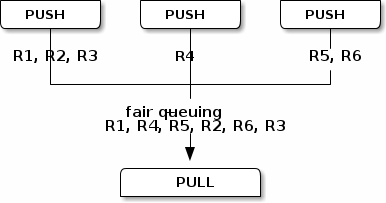 What happens if the component reading from a queue is very slow, and causes our queues to build up? What's our strategy then? Take a typical open source project like Hadoop Zookeeper and read the C API code in src/c/src/zookeeper.c. As I write this, in 2010, the code is 3,200 lines of mystery and in there is an undocumented, client-server network communication protocol. I see it's efficient because it uses poll() instead of select(). But really, Zookeeper should be using a generic messaging layer and an explicitly documented wire level protocol. It is incredibly wasteful for teams to be building this particular wheel over and over. But how to make a reusable messaging layer? Why, when so many projects need this technology, are people still doing it the hard way, by driving TCP sockets in their code, and solving the problems in that long list, over and over? It turns out that building reusable messaging systems is really difficult, which is why few FOSS projects ever tried, and why commercial messaging products are complex, expensive, inflexible, and brittle. In 2006 iMatix designed AMQP which started to give FOSS developers perhaps the first reusable recipe for a messaging system. AMQP works better than many other designs but remains relatively complex, expensive, and brittle. It takes weeks to learn to use, and months to create stable architectures that don't crash when things get hairy. Most messaging projects, like AMQP, that try to solve this long list of problems in a reusable way do so by inventing a new concept, the "broker", that does addressing, routing, and queuing. This results in a client-server protocol or a set of APIs on top of some undocumented protocol, that let applications speak to this broker. Brokers are an excellent thing in reducing the complexity of large networks. But adding broker-based messaging to a product like Zookeeper would make it worse, not better. It would mean adding an additional big box, and a new single point of failure. A broker rapidly becomes a bottleneck and a new risk to manage. If the software supports it, we can add a second, third, fourth broker and make some fail-over scheme. People do this. It creates more moving pieces, more complexity, more things to break. And a broker-centric set-up needs its own operations team. You literally need to watch the brokers day and night, and beat them with a stick when they start misbehaving. You need boxes, and you need backup boxes, and you need people to manage those boxes. It is only worth doing for large applications with many moving pieces, built by several teams of people, over several years. So small to medium application developers are trapped. Either they avoid network programming, and make monolithic applications that do not scale. Or they jump into network programming and make brittle, complex applications that are hard to maintain. Or they bet on a messaging product, and end up with scalable applications that depend on expensive, easily broken technology. There has been no really good choice, which is maybe why messaging is largely stuck in the last century and stirs strong emotions. Negative ones for users, gleeful joy for those selling support and licenses. What we need is something that does the job of messaging but does it in such a simple and cheap way that it can work in any application, with close to zero cost. It should be a library that you just link with, without any other dependencies. No additional moving pieces, so no additional risk. It should run on any OS and work with any programming language. And this is ØMQ: an efficient, embeddable library that solves most of the problems an application needs to become nicely elastic across a network, without much cost. It handles I/O asynchronously, in background threads. These communicate with application threads using lock-free data structures, so concurrent ØMQ applications need no locks, semaphores, or other wait states. 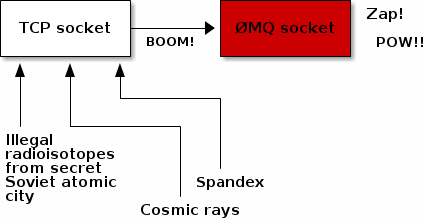 Components can come and go dynamically and ØMQ will automatically reconnect. This means you can start components in any order. You can create "service-oriented architectures" (SOAs) where services can join and leave the network at any time. It has ways of dealing with over-full queues (called "high water mark"). When a queue is full, ØMQ automatically blocks senders, or throws away messages, depending on the kind of messaging you are doing (the so-called "pattern"). It lets you route messages using a variety of patterns such as request-reply and publish-subscribe. These patterns are how you create the topology, the structure of your network. It does not impose any format on messages. They are blobs of zero to gigabytes large. When you want to represent data you choose some other product on top, such as Google's protocol buffers, XDR, and others. It handles network errors intelligently. Sometimes it retries, sometimes it tells you an operation failed. It reduces your carbon footprint. Doing more with less CPU means your boxes use less power, and you can keep your old boxes in use for longer. Al Gore would love ØMQ. Actually ØMQ does rather more than this. It has a subversive effect on how you develop network-capable applications. Superficially it's a socket-inspired API on which you do zmq_msg_recv(3) and zmq_msg_send(3). But message processing rapidly becomes the central loop, and your application soon breaks down into a set of message processing tasks. It is elegant and natural. And it scales: each of these tasks maps to a node, and the nodes talk to each other across arbitrary transports. Two nodes in one process (node is a thread), two nodes on one box (node is a process), or two boxes on one network (node is a box) - it's all the same, with no application code changes. Let's think for a second about what is happening here. The weather server has a single socket, and yet here we have it sending data to five clients in parallel. We could have thousands of concurrent clients. The server application doesn't see them, doesn't talk to them directly. So the ØMQ socket is acting like a little server, silently accepting client requests and shoving data out to them as fast as the network can handle it. And it's a multithreaded server, squeezing more juice out of your CPU. As you start to program with ØMQ you will come across one problem more than once: you lose messages that you expect to receive. Here is a basic problem solver that walks through the most common causes for this. Don't worry if some of the terminology is unfamiliar still, it'll become clearer in the next chapters. If you're using ØMQ in a context where failures are expensive, then you want to plan properly. First, build prototypes that let you learn and test the different aspects of your design. Stress them until they break, so that you know exactly how strong your designs are. Second, invest in testing. This means building test frameworks, ensuring you have access to realistic setups with sufficient computer power, and getting time or help to actually test seriously. Ideally, one team writes the code, a second team tries to break it. Lastly, do get your organization to contact iMatix to discuss how we can help to make sure things work properly, and can be fixed rapidly if they break. In short: if you have not proven an architecture works in realistic conditions, it will most likely break at the worst possible moment. In early 2012, ØMQ/3.2 became stable enough for live use and by the time you're reading this, it's what you really should be using. If you are still using 2.2, here's a quick summary of the changes, and how to migrate your code. The main change in 3.x is that PUB-SUB works properly, as in, the publisher only sends subscribers stuff they actually want. In 2.x, publishers send everything and the subscribers filter. Simple, but not ideal for performance on a TCP network. Most of the API is backwards compatible, except a few blockheaded changes that went into 3.0 with no real regard to the cost of breaking existing code. The syntax of zmq_send(3) and zmq_recv(3) changed, and ZMQ_NOBLOCK got rebaptised to ZMQ_DONTWAIT. So although I'd love to say, "you just recompile your code with the latest libzmq and everything will work", that's not how it is. For what it's worth, we banned such API breakage afterwards. So the minimal change for C/C++ apps that use the low-level libzmq API is to replace all calls to zmq_send with zmq_msg_send, and zmq_recv with zmq_msg_recv. In other languages, your binding author may have done the work already. Note that these two functions now return -1 in case of error, and zero or more according to how many bytes were sent or received. Other parts of the libzmq API became more consistent. We deprecated zmq_init(3) and zmq_term(3), replacing them with zmq_ctx_new(3) and zmq_ctx_destroy(3). We added zmq_ctx_set(3) to let you configure a context before starting to work with it. Finally, we added context monitoring via the zmq_ctx_set_monitor(3) call, which lets you track connections and disconnections, and other events on sockets. 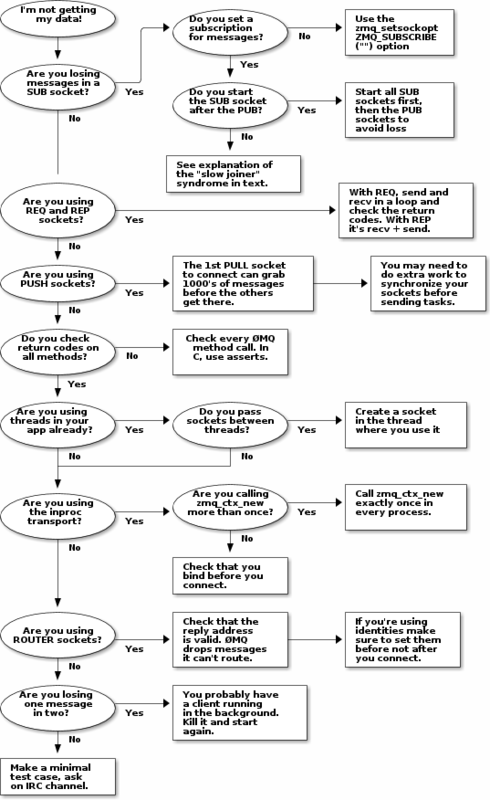 Traditional network programming is built on the general assumption that one socket talks to one connection, one peer. There are multicast protocols but these are exotic. When we assume "one socket = one connection", we scale our architectures in certain ways. We create threads of logic where each thread work with one socket, one peer. We place intelligence and state in these threads. In the ØMQ universe, sockets are doorways to fast little background communications engines that manage a whole set of connections automagically for you. You can't see, work with, open, close, or attach state to these connections. Whether you use blocking send or receive, or poll, all you can talk to is the socket, not the connections it manages for you. The connections are private and invisible, and this is the key to ØMQ's scalability. Because your code, talking to a socket, can then handle any number of connections across whatever network protocols are around, without change. A messaging pattern sitting in ØMQ can scale more cheaply than a messaging pattern sitting in your application code. If you're reading this Guide for the first time, realize that until you actually write ØMQ code for a day or two (and maybe three or four days), you may feel confused, especially by how simple ØMQ makes things for you, and you may try to impose that general assumption on ØMQ, and it won't work. And then you will experience your moment of enlightenment and trust, that zap-pow-kaboom satori paradigm-shift moment when it all becomes clear.